The most common oral complications in divers are odontocrexis (dislodgement of dental restorations),,, and barometric-related dental pain ,, caused by air bubbles and increased pressure at the restoration–tooth interface. However, these can be prevented using resin-based materials that are more resistant to pressure changes. In addition to odontocrexis, TMD caused by heavy or poorly designed mouthpieces,,, cross-contamination of pathogens caused by improper disinfection of shared equipment and flaring of periapical infections and cysts  are also common. As many of these conditions can be diagnosed and treated by dentists, it is imperative that general dental practitioners in the UAE are prepared for such complications. The aim of this project is to identify the most common effects of frequent pressure variation on the oral health of divers in the UAE. The information obtained from this study will be used to create accurate diagnostic tools and treatment guidelines for dentists in the UAE who treat divers. In addition, the materials used for dental restorations and cementation in the Ras Al Khaimah (RAK) College of Dental Sciences dental clinic will be tested under conditions similar to those experienced by divers to assess their resistance to pressure changes. A questionnaire was completed by six divers aged 25–45 years with diving experience ranging between 2 and 25 years. The divers belonged to RAK Police and dived routinely as part of their training. The questionnaire included demographic, occupational and barotrauma-related questions. Oral examination was performed to identify oral signs of pressure exposure in orofacial structures and dislodgement of dental restorations. The most frequent events were identified and summarised. The data were analysed, comparing diving depth, diving frequency and type of barotrauma. The experiment was performed on 14 extracted teeth. Class I preparations were carved for restoration with a 2-mm depth. A 0.5-mm layer of glass ionomer cement (Medfil, Promedica, Germany) was applied to the base of the cavity on all teeth. All samples were acid etched (FineEtch ® 37, Spident, Korea) and lined with a composite bonding agent (EsBond, Spident, Korea) to create a hybrid layer on both the composite and amalgam restorations. The bonding agent does not bind to the amalgam restoration, but the samples were treated equally for standardisation purposes. Composite (EsCom100, Spident, Korea) restorations were performed on six teeth using the layering technique, while another six teeth were obturated with amalgam (Den Alloy, War-Med International Inc., Rockwell, NC, USA). Two control samples were prepared: one without a bonding agent (positive control) and one with cyanoacrylate instead of a bonding agent (negative control). The samples were introduced into a polymerisation machine (MultiCure, Vetex, UK) at 37°C, to mimic body temperature, and at 0.5–0.6 MPa, to replicate the pressure experienced by deep divers, for 10 min. These parameters are specified by the National Association of Underwater Instructors (Worldwide). The experiment involved seven rounds of the specified conditions. Survival of restorations and changes in samples were monitored. The oral health of divers was classified according to their diving experience and frequency [Table 1]. Pressure-related orofacial pain was reported only by divers who had more diving experience and who dive to greater depths. Composite and amalgam fillings appeared damaged in all divers regardless of diving depth, frequency or experience. Diver A, who is the most experienced and frequent diver, was examined radiographically. Radiography revealed generalised horizontal bone loss that was not associated with periodontal disease or traumatic occlusion [Figure 1]. 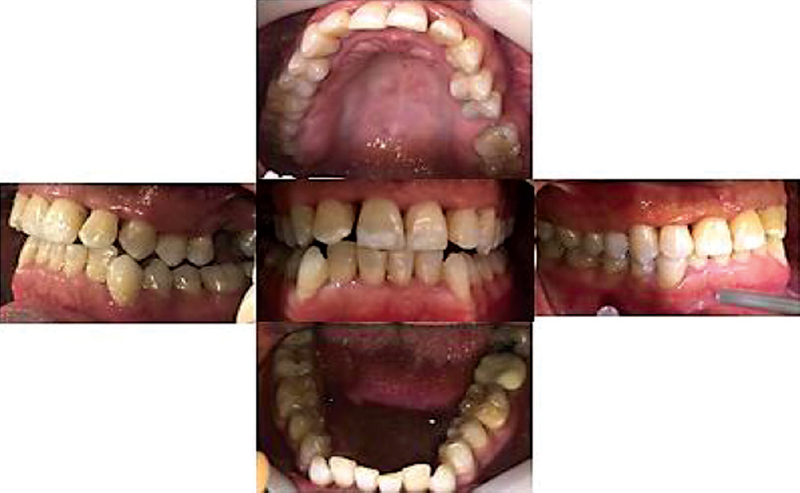 Intra-oral examination revealed the effect of diving pressure on the periodontium: complete loss of the scalloped knife-edge gingiva, generalised gingival recession and teeth fissuring [Figure 2]. The results of the in vitro assessment of restoration survival are listed in [Table 2]. In round 1 of pressurised conditions, as expected, the negative control and two amalgam fillings showed visible fissures. 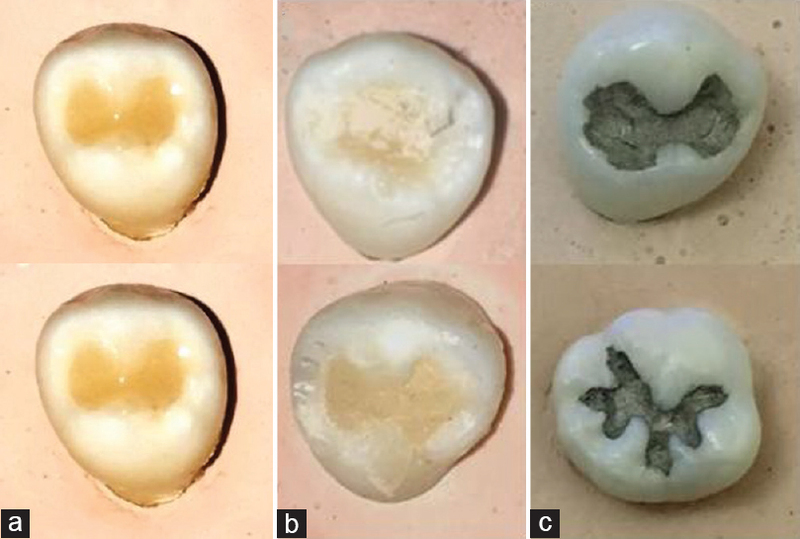 By round 3, all amalgams had visible fissures, and in round 4, five out of six amalgams had visible marginal steps representing extrusion of the restoration from the preparation cavity [Figure 3]c and [Figure 4]. Composite restorations were fissured during rounds 3 and 5, which were rounds, in which the pressure reached 6.08 MPa [Figure 3]b. The negative control fissured in round 6. 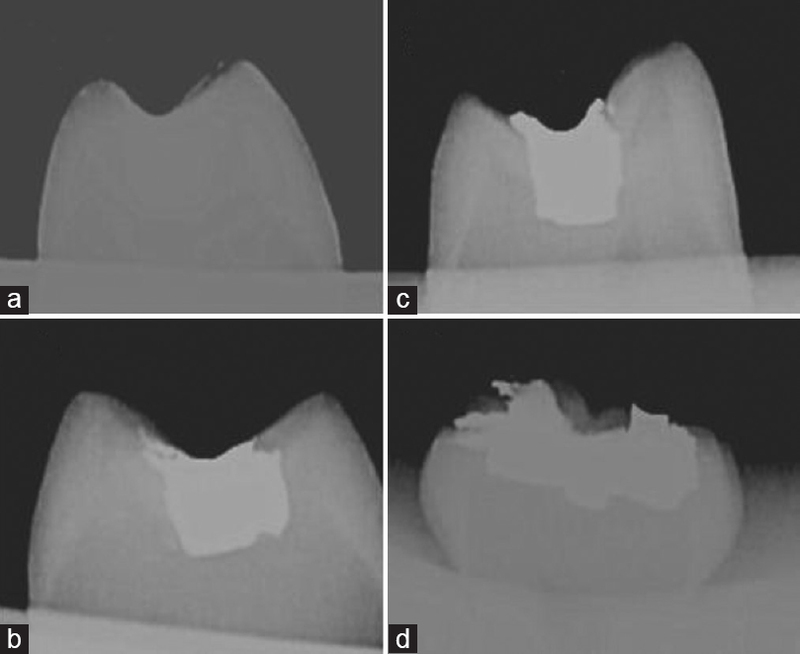 Chipping of the outside layer of the restorations was uncommon but observed in both composite and amalgam [Figure 3]b and [Figure 3]c. Two composite restorations remained intact throughout the experiment [Figure 3]a. Radiography revealed spaces in the floor of amalgam restorations and the marginal step on both composite and amalgam restorations [Figure 4]. This study included both an epidemiological assessment of the most common oral complications in local divers and an in vitro assessment of dental materials used for restoration. Fractured restorations and orofacial pain were reported by occupational divers. Fracture of both amalgam and composite restorations was observed in vitro; however, dislodgement and early fracture were observed only in amalgam restorations. Fractured restorations, both amalgam and composite, were observed in all divers; however, pain was reported only by the most frequent and experienced divers. Previous studies report fractures only on amalgam restorations; however, many of these studies were based on questionnaires without clinical observation of the affected divers. Previous reports also show that the incidence of pain tends to be higher in deep divers,, which is in accordance with the results of this study. The tooth enamel surrounding the restorations showed fissures both in vivo and in vitro, which has not been widely reported. The in vitro assessment demonstrated that both composite and amalgam restorations were affected by pressure, although damage to composite restorations was less severe and occurred only after multiple exposures to the pressurised environment. Dental composite typically consists of an inorganic filler such as silicon dioxide (silica) and a resin-based oligomer matrix bonded by silane, which causes elasticity in the material. This elasticity may contribute to the improved resistance observed in composite restorations. Moreover, studies of the polymer matrix of composite materials show that hydrostatic pressure can significantly increase the polymer's strength, stiffness and yield strength. The dental amalgam alloy is made of silver, tin and copper and may also include indium, palladium and zinc.,, This metallic composition makes the amalgams sturdier but less elastic and more prone to fracture. In addition to the composition of both restorative materials, we should also point out that composite fillings bond micromechanically to tooth structure through a hybrid layer, but amalgams rely on the geometry of the preparation for retention. 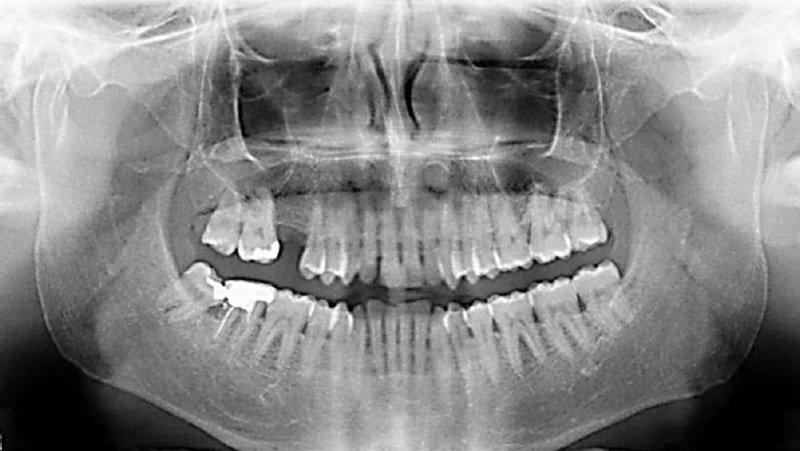 The hybrid layer in composites will maintain the integrity of the union of both materials; however, in amalgams, a space will remain between the restoration and the tooth, which can be filled with air and separated when subjected to pressure., This phenomenon, known as 'tooth squeeze', is more likely to occur in divers with tooth decay, dental infections or recent tooth extraction or fillings; however, it could also apply to amalgam restorations, in which the micromechanical bond is not achieved and when a gap is left between the restoration and the tooth. The limitations of this pilot study include the sample size, which was small, meaning that the results cannot be generalised; however, the results clearly show damage to the teeth and dental restorations. In addition, only two dental materials were examined in the study, which is not definitive, as a large number of variations of material composition are available on the market. Further examination of divers' oral health and assessment of different materials under pressure are required. The increase in pressure during diving can affect the integrity of both amalgam and composite dental fillings. Composite fillings can withstand increased pressure for longer than amalgam fillings, but will eventually show damage, as observed both in vitro and in vivo. This pilot study demonstrates that further research should be conducted to develop a pressure-resistant filling material and the oral health of occupational divers should be monitored to control the extent of damage. According to our observations, dentists should avoid performing amalgam restorations in divers and instead perform composite restorations using the layering technique. Restorations should be monitored periodically as damage is incremental owing to continual exposure to pressure. The authors wish to thank RAK Police for their valuable collaboration. Aldridge RD, Fenlon MR. Prevalence of temporomandibular dysfunction in a group of scuba divers. Br J Sports Med 2004;38:69-73. Grant SM, Johnson F. Diver's mouth syndrome: A report of two cases and construction of custom-made regulator mouthpieces. Dent Update 1998;25:254-6. Gulve MN, Gulve ND. Provisional crown dislodgement during scuba diving: A Case of barotrauma. Case Rep Dent 2013;2013:749142. Gulve MN, Gulve ND. The effect of pressure changes during simulated diving on the pull out strength of glass fiber posts. Dent Res J (Isfahan) 2013;10:737-43. Nakdimon I, Zehavi E, Chapnik L, Zadik Y. The influence of barometric pressure changes in the oral cavity: Dental barotrauma and barodontalgia. Refuat Hapeh Vehashinayim (1993) 2014;31:19-25, 60. Peker I, Erten H, Kayaoglu G. Dental restoration dislodgment and fracture during scuba diving: A case of barotrauma. J Am Dent Assoc 2009;140:1118-21. Robichaud R, McNally ME. Barodontalgia as a differential diagnosis: Symptoms and findings. J Can Dent Assoc 2005;71:39-42. Zadik Y. Barodontalgia: What have we learned in the past decade? Oral Surg Oral Med Oral Pathol Oral Radiol Endod 2010;109:e65-9. Scheper WA, Eijkman MA. The use of mouthguards. Ned Tijdschr Tandheelkd 2005;112:173-6. Scheper WA, Lobbezoo F, Eijkman MA. Oral problems in divers. Ned Tijdschr Tandheelkd 2005;112:168-72. National Association of Underwater Instructors. Dive Tables Review; 2017. Available from: http://www.naui.org/resources/dive-tables-review/. [Last accessed on 2017 Nov 26]. Zimmerli B, Strub M, Jeger F, Stadler O, Lussi A. Composite materials: Composition, properties and clinical applications. A literature review. Schweiz Monatsschr Zahnmed 2010;120:972-86. Hoppel CP, Bogetti TA, Gillespie JW. Effects of hydrostatic pressure on the mechanical behavior of composite materials. J Thermoplastic Compos Mater 1995;8:375-409. Bharti R, Wadhwani KK, Tikku AP, Chandra A. Dental amalgam: An update. J Conserv Dent 2010;13:204-8. Osborne JW, Norman RD. 13-year clinical assessment of 10 amalgam alloys. Dent Mater 1990;6:189-94. Letzel H, van 't Hof MA, Marshall GW, Marshall SJ. The influence of the amalgam alloy on the survival of amalgam restorations: A secondary analysis of multiple controlled clinical trials. J Dent Res 1997;76:1787-98. Composite Fillings (vs. Amalgam); 2000-2017. Available from: http://www.animated-teeth.com/tooth-bonding/a9-white-composite-fillings.htm. [Last accessed on 2016 Jun 01]. Tooth Squeeze; 2017. Available from: http://www.emedicinehealth.com/wilderness_tooth_squeeze/article_em.htm#tooth_squeeze_overview. [Last accessed on 2016 Jun 01].